Also called Mt. Cavalry Church or Neriah Church on various maps. From the Baldwin County Courthouse, go west on Hancock Street for 2 blocks or 0.2 mile (or the one large block containing Georgia College & State Univ.). Turn right on Clarke Street. Go one large block or 0.2 mile. Turn left onto Highway No. 22 west (Montgomery St.). Go 2.4 miles. Turn right on Highway 212 west. Go 9.0 miles. Turn right on Neriah Rd to the church. Go 300 feet. The front part of the cemetery is on your left. 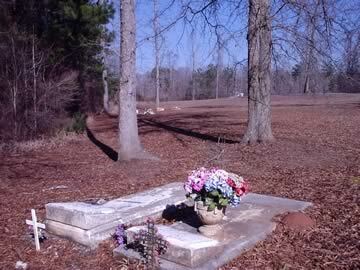 Relatively new grave as of Feb 4, 2005.